The Vancouver Canucks travel to Joe Louis Arena to play the Detroit Red Wings on Friday, December 18, 2015. The opening line for this game has the Canucks at +158 and the Red Wings at -175. The over/under has been set at 5. Vancouver comes into this matchup having played 32 games. They have an overall record of 11-13-8 and on the road they have a record of 6-7-5. Currently they are 6th in the Pacific Division. They've scored 81 goals and given up 92 goals for a point differential of -11. Detroit shows up with a record of 16-9-6 including 10-6-3 at home this season. They are 3rd in the Atlantic Division. They've scored 79 goals and surrendered 79 for a goal differential of 0. Daniel Sedin has accumulated 34 total points this season for the Canucks. He has 14 goals this season with 116 shots on goal giving him a shooting percentage of 12%. He has a total of 20 assists on the season and averages 19 minutes played per game. Henrik Sedin has averaged 19 minutes of ice time per game this year. In that time he has a shooting percentage of 21% by scoring 9 goals on 43 shots. He has 22 assists giving him a total of 31 points on the season. Ryan Miller has 9 wins and 11 losses this season in net for the Canucks. He has had 766 shots against him and has given up 69 goals. He has made 697 saves for a save percentage of 91%. Dylan Larkin has accumulated 22 total points this season for the Red Wings. He has 11 goals this season with 87 shots on goal giving him a shooting percentage of 13%. He has a total of 11 assists on the season and averages 17 minutes played per game. 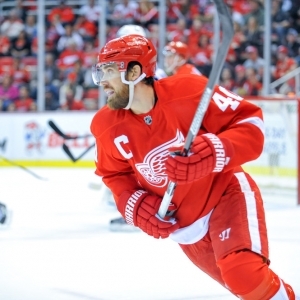 Henrik Zetterberg has averaged 19 minutes of ice time per game. In that time he has a shooting percentage of 7% by scoring 5 goals on 67 shots. He has 19 assists giving him a total of 24 points on the season. Jimmy Howard has 7 wins and 4 losses this season in net for the Red Wings. He has had 406 shots against him and has given up 32 goals. He has made 374 saves for a save percentage of 92%. The Canucks have 30 total points this season. They have scored 80 goals while giving up 91 goals. They have had 114 power play opportunities and have scored 21 goals on those chances for a percentage of 18%. The Canucks have allowed 104 power play opportunities and given up 23 goals on those chances for a penalty kill percentage of 78%. They average 29 shots per game and as a team are shooting 8.57% for the season to this point. They allow 30 shots to their opposition per contest and have a team save percentage of 91%. The Red Wings have a total of 38 points on the season. They have 18 power play goals on 99 opportunities thus far for a percentage of 18%. They have allowed 104 power play opportunities and have given up 19 goals on those chances for a penalty kill percentage of 82%. As a team, the Canucks have a total of 78 goals scored while they've given up 78 goals to this point. They average 29 shots per contest and have a team shooting percentage of 8.77%. As a team they give up 31 shots per game and have a save percentage of 92%.